Phosphohistone H3 (pHH3) is a recently described marker specific for cells undergoing mitosis. Serine 10 of Histone H3 is phosphorylated in association with mitotic chromatin condensation in late G2 and M phase of the cell cycle and thus, pHH3 can distinguish mitosis from apoptotic nuclei (1). Microscopic evaluation of mitotic figures by hematoxylin and eosin (H&E) staining is a routine procedure in the assessment of the prognostic grade of tumors (2,3). 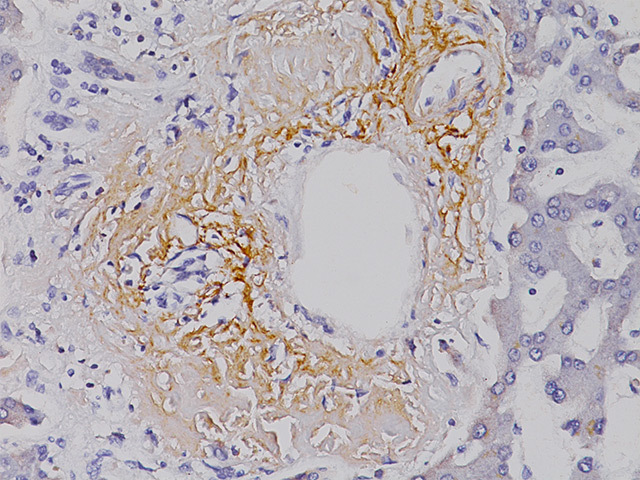 The immunohistochemical (IHC) staining of pHH3 (Ser10) has been reported to be comparable to mitotic figure staining in the H&E section (4-6). However, in some cases, H&E staining may misclassify mitotic cells as apoptotic bodies or piknotic nuclei, resulting in an underestimation of the mitotic index (MI). IHC with pHH3 may provide a more accurate assessment of all mitotic cells, as well as cells in which Histone H3 has been phosphorylated immediately prior to entering prophase (7). Prognostic significance of the mitotic index using an anti-pHH3 antibody has been reported to be of great value in breast cancer, melanoma and meningiomas (8,9). 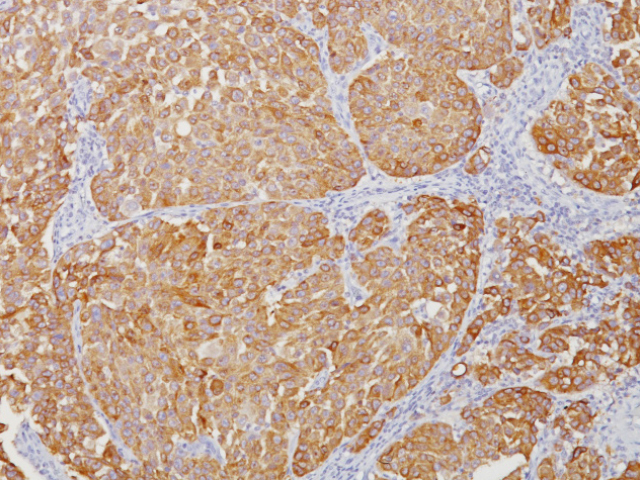 A rabbit monoclonal (RM) antibody targeting phosphorylated Serine 10 of pHH3, clone [BC37], has been developed and characterized by Western blot, ELISA, and IHC. In tonsil and melanoma, pHH3 (RM) displays stronger staining intensity in mitotic figures compared to the polyclonal pHH3. Additionally, pHH3 (RM) does not exhibit granular staining in interphase nuclei, unlike the polyclonal pHH3 (Figure 1A, 1B). 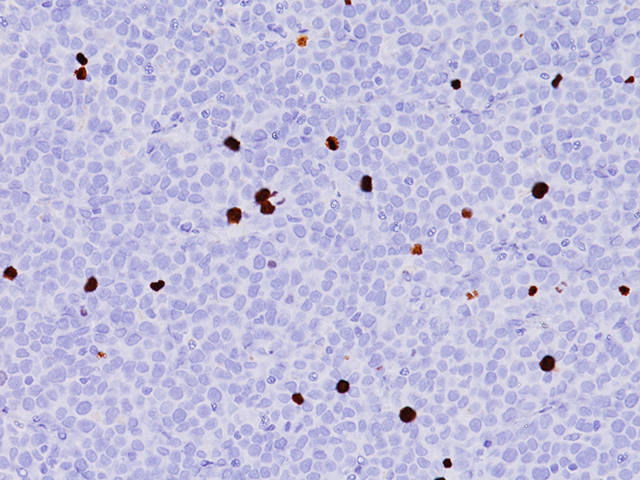 pHH3 (RM) may offer other advantages common to rabbit monoclonal antibodies, including a specific epitope and lot-to-lot consistency. 1. Ladstein RG, et al. 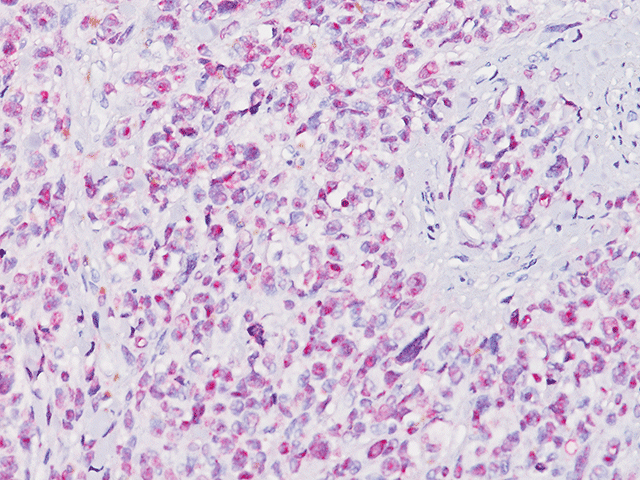 Prognostic importance of the mitotic marker phosphohistone H3 in cutaneous nodular melanoma. J Invest Dermatol. 2012 Apr; 132(4):1247-52. 2. Jannink I, van Diest PJ, Baak JP. Comparison of the prognostic value of four methods to assess mitotic activity in 186 invasive breast cancer patients: classical and random mitotic activity assessments with correction for volume percentage of epithelium. Hum Pathol. 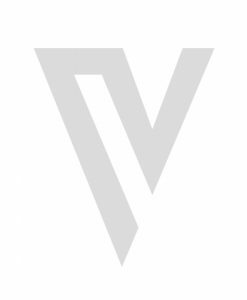 1995 Oct; 26(10):1086-92. 3. Yadav KS, et al. Assessment of interobserver variability in mitotic figure counting in different histological grades of oral squamous cell carcinoma. J Contemp Dent Pract. 2012 May 1; 13(3):339-44. 4. Thareja S, et al. Analysis of tumor mitotic rate in thin metastatic melanomas compared with thin melanomas without metastasis using both the hematoxylin and eosin and anti-phosphohistone 3 IHC stain. Am J Dermatopathol. 2014 Jan; 36(1):64-7. 5. Ikenberg K, et al. 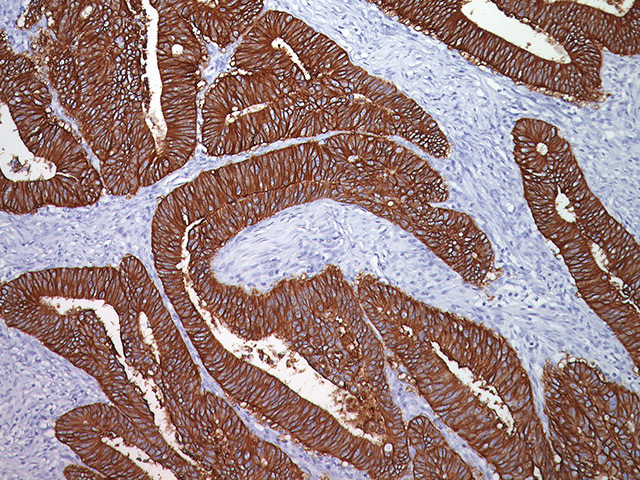 Immunohistochemical dual staining as an adjunct in assessment of mitotic activity in melanoma. J Cutan Pathol. 2012 Mar; 39(3):324-30. 6. Casper DJ, et al. 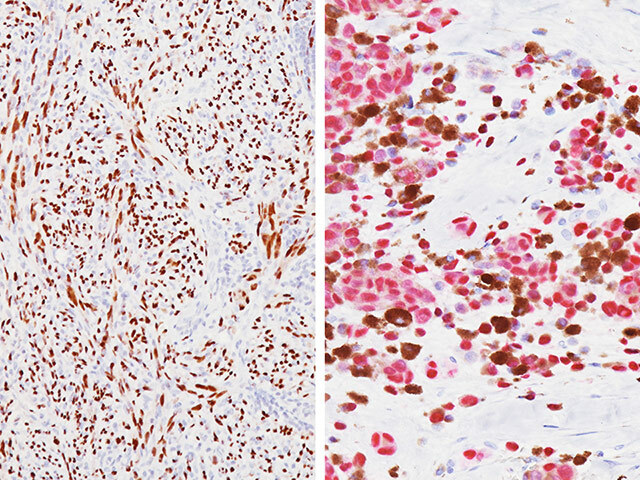 Use of anti-phosphohistone H3 immunohistochemistry to determine mitotic rate in thin melanoma. Am J Dermatopathol. 2010 Oct; 32(7):650-4. 7. Veras E, et al. Mitosis-specific marker phospho-histone H3 in the assessment of mitotic index in uterine smooth muscle tumors: a pilot study. Int J Gynecol Pathol. 2009 Jul; 28(4):316-21. 8. Skaland I, et al. Phosphohistone H3 expression has stronger prognostic value than classical prognosticators in invasive lymph node-negative breast cancer patients less than 55 years of age. Mod Pathol. 2007 Dec; 20(12):1307-15. 9. Kim YJ, et al. Prognostic significance of the mitotic index using the mitosis marker anti-phosphohistone H3 in meningiomas. Am J.Clin Pathol. 2007 July; 128(1):118-25. 11. Clinical and Laboratory Standards Institute (CLSI). Protection of Laboratory Workers from Occupationally Acquired Infections; Approved Guideline-Fourth Edition CLSI document M29-A4 Wayne, PA 2014.